PHOTO BY MATT BURKHARTT A section of a mural by Argentinian artist Ever, created for the 2013 WALL\THERAPY season. The 2017 festival will take place July 21 through 30. Rochester's mural festival, WALL\THERAPY, returns Friday, July 21, through Sunday, July 30, presenting a theme of arts, activism, and community. The festival has been held each July since 2011, except for 2016 when the organization participated in an artist exchange with a Berlin-based arts group. The organizers originally had "storytelling" as a loose theme for this year, "but then the election happened, and suddenly it didn't sit right," says Erich Lehman, WALL\THERAPY lead organizer and co-curator. "It was like, we can't just be fluffy." Lehman says the new activism theme was also inspired by the fact that WALL\THERAPY was named "Best Group or Person Improving the Community" in CITY Newspaper's 2015 and 2016 Best of Rochester readers' poll. 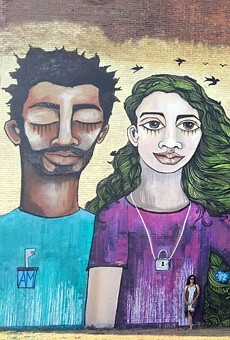 The organization, which has installed more than 100 murals in Rochester over the last six years, is interested in strengthening its engagement with Rochester's communities, Lehman says. This year's festival will include free programming intended to connect Rochester residents of all ages and all walks of life. In addition to the 10-day festival, the group is launching a conference focused on arts and activism on July 29, followed by a Block Party, with music by Danielle Ponder and the Tomorrow People, at the new multi-use Kaleidoscope Collective Community Center. The 2017 roster will feature 10 artists from a wide range of backgrounds, including six Rochesterians and four muralists from around the nation. There are a handful of previous participants whose subject matter would have fit this year's theme perfectly, Lehman says. "But we wanted to reach out to folks who wouldn't necessarily get an invite to a big mural festival. We felt their voices deserved a chance on a bigger stage, and that their particular voices might be challenged in the current political environment." The participants are using the arts to address things they feel need to be dealt with in their own communities and around the world. "The issues range from women's issues, to the refugee crisis, to immigration, to community," Lehman says. The 2017 lineup includes Ian Kuali'i (Berkeley, California), whose mixed-media work is influenced by his ancestral ties to the indigenous people of the Southwest US and Hawai'i; Sean 9 Lugo (Jersey City, New Jersey), whose wheatpaste art considers the duality of Latin and American culture and complexities of perception; Lucinda Yrene, known as La Morena (Phoenix, Arizona), a Chicana self-taught muralist, artist, and curator who helps facilitate mural projects in Phoenix with immigrant rights organizations; and Jess X. Snow (Brooklyn), an Asian-American artist, filmmaker, and poet whose work tackles queer liberation, migration, sexuality, and motherhood. 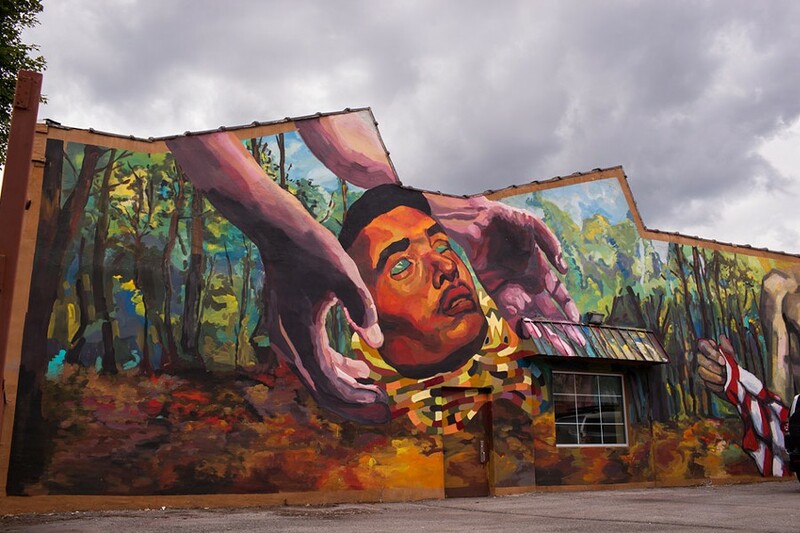 Rochester-based artists include Aubrey Roemer, whose work has taken her all over the world and is rooted in environmental initiatives and refugee relief; Todd Stahl, a high school art teacher and mixed-media painter whose work often spotlights social justice heroes; and Sarah C. Rutherford, who is currently entrenched in her mural-series, "Her Voice Carries." Rutherford's mural for WALL\THERAPY will be one of the murals in this series. The other three local artists are teens who are members of Roc Paint Division, an organization that since 2015 has been adorning the city's R-Centers with inspiring murals while employing and training young, developing artists. Roc Paint Division artists Nzinga Muhammad, Etana Browne, and Kaori-Mei Stephens were selected to create a mural together for this year's festival. WALL\THERAPY is supported through crowd-sourced funding campaigns and a dedicated group of volunteers. But on the eve of the festival, the fundraising endeavor hasn't hit its goal. There's still time to support it, Lehman says. Those interested in volunteering can email volunteer@wall-therapy.com or click the "donate/volunteer" link at wall-therapy.org. The festival's inaugural conference, "Arts & Activism," will take place on Saturday, July 29, from 10 a.m. to 3 p.m. at the Little Theatre (240 East Avenue). The keynote speaker will be Jessica Pabón-Colón, assistant professor of Women's, Gender, and Sexuality Studies at SUNY New Paltz. A complete schedule for the free event will be released soon. Later that evening, from 6:30 p.m. to 11 p.m., the block party will also feature an open air artist market, food trucks, beverage service, and live art at the new Kaleidoscope Collective Community Center (936 Exchange Street). CITY will have coverage of WALL\THERAPY throughout the festival, including images, interviews, and blogs. Follow along here and on Instagram at @roccitynews.